Reality bites in F1. Organisers of both of F1's Spanish races, the Spanish Grand Prix in Montmelo near Barcelona and the European Grand Prix on the Valencia street circuit, have made it known in recent weeks that they'll need less costly deals if the events are to continue. This is not surprising given the state of the world economy, which has hit Spain harder than many. A deal will be done presumably to ensure Spain continues on the F1 calendar - you'd think it would have to given Alonso-mania - though it's hard to see how two Spanish events can prevail, especially in an age where Bernie's keen to reduce the European presence on the calendar and with many countries queuing to get on it. Spain's history of hosting F1 races is a long one, the first ever Spanish Grand Prix in the formula was in 1951. But the latest threats to the Spanish races continues the rather hit-and-miss and nomadic existence of Spanish F1 venues over the decades. Six different circuits in Spain have hosted F1 Grands Prix (including Valencia, which has always had the 'European GP' moniker). The first venue used was the attractive Pedralbes track, run through wide open avenues in Barcelona's suburbs. It was used twice in total (the other race there was in 1954), before the Le Mans disaster the next year, and its fallout vis-a-vis circuit safety, did for it. The Spanish Grand Prix then disappeared from the calendar all the way through to 1968, when it resurfaced at the rather torturous, twisty and unpopular Jarama track near Madrid. That venue held the race on and off until 1981, with its final appearance that year giving witness to the classic and lauded win under pressure by Gilles Villeneuve. The Spanish race then disappeared again for a while, until 1986 when the Jerez circuit in the south of the country became its host. It was an impressive facility, arguably the first of the 'modern' F1 venues that populate the calendar so heavily these days. Similar to Jarama it was known for being tight and twisty, but its main problem was that it never began to pull in a crowd, due in large part to being situated rather remotely, far away from Spain's major population centres. It lost the race eventually in 1991, though made a couple of further appearances in the 1990s as a last minute replacement for drop-outs elsewhere, and it continues to be used as an F1 test venue. Jerez was replaced by the Montmelo track near Barcelona, and it seemed that finally the Spanish round had found a permanent home. This was further cemented later by Spain finally uneartheding a top-level driver of their own in Fernando Alonso. And this was a lot of the reason why Barcelona was joined on the calendar by the Valencia street circuit in 2008. The Valencia track hasn't won any popularity contests though, not helped by the fact that it has been dogged by undiverting races in its short existence. But there was one Spanish Grand Prix venue in history that was a real hit. It was a street track like out of your dreams. Faster, more varied and more challenging than Monaco, more picturesque as well. That track was Montjuïc. Montjuïc is a shallow hill to the south west of Barcelona's centre, near the harbour. The track, made up of public streets, wound and swooped itself down and up the hillside, the first half of the lap consisting of a series of steep downhill hairpins, while the return uphill leg was fast, sweeping and especially challenging, all the while with barriers close by. Gradient change was very much a characteristic of the place, and in the run to the first corner cars would leave the ground over a sharp hill crest before immediately braking heavily downhill for a sharp hairpin. And then there was the circuit's surroundings: the backdrop was one of rich green foliage and flowers of the hill's parkland interspersed by elegant architecture, with an abundance of domes and spires. This was most notably so in the imposing and opulent Palau Nacional, which the track circulated. And the rich blue Mediterranean lay beyond all of this. Barcelona tends to view itself as Spain's spiritual home of racing, and this reflects the history of Montjuïc as much as anywhere else. Indeed, the Montjuïc track was used for racing in the Penya Rhin Grand Prix back as far back as 1933, a race that attracted none other than Tazio Nuvolari which contributed greatly to its entry and success. Civil War, international isolation and fuel and vehicle shortages meant little racing there in the late 1930s and 1940s, though modest events began to reappear at Montjuïc in the next decade including, more impressively, a sports car race in 1954. The track's resurgence got properly into gear in 1966 when the Real Automovile Club de Catuluna reopened the track, resurfacing it and installing barriers to keep errant cars out of the trees and buildings. International Formula Two races were held at Montjuïc in each of the next three seasons, before it achieved the holy grail of attracting an F1 Grand Prix in 1969. The venue then alternated with Jarama (thanks to Spanish inter-regional politics) as host of the Spanish round on the calendar, through until the catastrophic Grand Prix weekend at Montjuïc in 1975. And that pretty much summed Montjuïc's short existence up as an F1 venue: fast, spectacular, challenging, but the flip side was that danger was never far away. It was a street track from your dreams, but capable on occasion of making you endure a nightmare. This was evident in F1's first race there, in 1969 as mentioned, and it was an uncomfortable foretaste of the nightmare that was to end Montjuïc as an F1 venue six years later. Early 1969 was in the brief era of absurdly high and flimsy rear wings on F1 cars, some of which swayed in a stiff breeze, and at Montjuïc their associated risk came to a head. Running through the crested gentle left hander beyond the pits while placed third in the early laps, Graham Hill's rear wing on his Lotus collapsed, resulting in a violent smash into the barriers that he was fortunate to walk away from. Hill then spotted that the rear wing of his team mate, race leader Jochen Rindt, was showing similar signs of wear. But before word could be got back to the Lotus pit Rindt's wing collapsed at the same point of the track as Hill's had, he collided with the wreckage of Hill's stricken car and rolled over before coming to rest. Rindt was bloodied and bruised, but was fortunate that was the extent of his injuries. The race was won eventually by Jackie Stewart. Rear wings were banned at the next race, then reappeared with their heights severely restricted the race after, and many commended Montjuïc's safety arrangements, with crash barriers around its entire perimeter and which had stood up to two such violent impacts. Such arrangements meant that Montjuïc was considered as pioneering on the safety front - it seems amazing to think now but barriers were only beginning to become de rigueur in F1 at this point. The next race at Montjuïc, two years later in 1971, was probably the best there in its short F1 history. It was won in classic style by Jackie Stewart, outperforming and outsmarting Jacky Ickx in the probably quicker Ferrari V12. It seems galling to think that before this race the Cosworth engine was thought commonly to have had its day (galling because the engine was still powering drivers and cars to championships ten years later! ), with the V12 engines such as the Ferrari and Matra apparently all set to take over. In the Montjuïc round it seemed that this would be the case, with the first three on the grid powered by V12s and Stewart, the leading Cosworth, starting only in fourth. But in the early laps of the race Stewart made good on the early advantage of the Cosworth's smaller and therefore lighter race fuel load, and squeezed into the lead past Ickx in the fast section at the start of lap six after pressuring the Belgian into an error, and then leaving him. Ickx, with the fuel burning off, came back at the rapid Stewart late in the race in a furious chase, the two men lapping quicker than they had in qualifying. Stewart wasn't to be denied though, and won by a handful of seconds. It was also Tyrrell's first win as a constructor, Uncle Ken's previous wins having come with a Matra chassis. The 1973 race was where Ronnie Peterson seriously announced himself as an F1 pace setter, and a spectacular one at that. Having joined Lotus for that season as world champion Emerson Fittipaldi's team mate, at Montjuïc Peterson in the iconic black and gold Lotus 72 took pole by a distance and led dominantly before being sidelined by a broken gearbox with 19 laps to go. This allowed team mate Fittipaldi to take over the lead, but this wasn't the end of things as he had to nurse home a slowly deflating rear tyre to win, which he did do. Then came the shameful 1975 Grand Prix weekend, which did for Montjuïc as an F1 venue definitively. The goings on of that meeting could fill up a blog post single-handedly, but to cut a long story short it was a weekend wherein commerce and politics overtook safety, and displayed graphically the folly of organisers and teams coercing reluctant drivers into their cars, especially when they'd had minimal practice. As mentioned, when F1 first visited Montjuïc its arrangement of barriers was considered genuinely pioneering, but by 1975 and after the wear of four assemblies the barriers were to lead to the venue's downfall. That year the fraternity turned up at Montjuïc to find the barriers in a wholly unsatisfactory state. Some bolts, supposed to be holding the plates in place, were only finger tight, some were not present at all, others smaller than their bolt holes. The barrier posts were also inadequate, many would move easily in your hand. Drivers, under the collective of the Grand Prix Drivers' Association (GPDA), understandably refused to drive in such conditions. And they undoubtedly had right on their side: in recent years the deaths in action of Helmuth Koinigg, Peter Revson and Francois Cevert all had poorly fitted barriers as a major contributory factor. There was also the point, as Mario Andretti pointed out at the time, that under Spanish law a driver was liable in civil court for any harm done to spectators. It didn't stop many watching on, including Denis Jenkinson in Motor Sport, to suggest that the drivers were not being true to their profession by refusing to run. The gathered spectators seemed to have little sympathy as well. Only Jacky Ickx (not a GPDA member) and Vittorio Brambilla (who didn't speak much English and gave the impression that he genuinely didn't know what was going on) appeared on the track during Friday. Perhaps the drivers made their main mistake by not packing up and going home at this point, but circuit officials promised overnight repairs and the drivers therefore promised to inspect the barriers at noon the next day. The likelihood of this making things satisfactory was minimal though, Tyrrell designer Derek Gardner calculated that it would have taken 1,600 men eight hours to make sufficient repairs, whereas only a handful worked on the barriers overnight. Things had indeed barely improved by the next day, James Hunt commenting that the work had only been 'cosmetic'. The constructors, looking at their contractual commitments, were getting nervous by this point however. They had done their best to get their 'foot in the door' of the Texaco van that the drivers were congregated in, and indeed early on Saturday afternoon team members had gone around the track doing around two hours' worth of barrier repairs themselves. And as for the CSI (as the sporting arm of the FIA was then called), they were completely unhelpful, washing their hands of the dispute, generally being uncontactable and, absurdly, declaring the circuit as suitable for an F1 race by their standards. Then at around quarter to four on the Saturday afternoon the organisers took the nuclear option. They gave the drivers a flat ultimatum: either the contractual commitments of the entrants would be honoured or they would resort to legal action which would involve, as a matter of course, the Spanish police impounding the teams' equipment pending the litigation. This year, for the first time, the Montjuïc paddock was situated inside the derelict Olympic stadium situated behind the pits, and it was clear that all of the cars, transporters and everything else could be locked up inside it within seconds. At this point the drivers' unity, under pressure from the organisers and their panicked teams, dissolved. In ones and twos they sadly made their way to their cars for final practice. It was thought by many that they would just do the minimum three laps stipulated in the contract, and at low speed. This was certainly Emerson Fittipaldi's understanding (he was seen by many as the drivers' 'leader' in this case), and he did just that then went home (and Wilson Fittipaldi and Arturo Merzario withdrew after a lap of the race). However the rest, sat in a racing car and faced with a competitive situation, couldn't help themselves and went for it the short single practice session prior to race day, which would also decide the grid. The race itself was, in the words of Autocourse, 'short and sharp and not at all sweet', and the drivers involved 'put on a display of shunting never before seen', perhaps not surprising given how they'd been treated and the lack of practice they'd had on this, the most challenging of tracks. The first shunt was in the run to the first corner. The Ferraris, with Lauda ahead of Regazzoni, had monopolised the grid's front row, but under braking for the first hairpin Lauda was nudged in the back by Andretti who'd in turn been nudged by Brambilla. This sent Lauda's Ferrari broadside across the track into his team mate Regazzoni: scratch two Ferraris (Regazzoni did keep going after repairs, but several laps down). Somehow, everyone aside from Depailler managed to pick their way through this unscathed. It all left James Hunt in his Hesketh in the lead, followed by Andretti's Parnelli and then John Watson, going amazingly well in his Surtees. Hunt tagged a barrier after going over oil on the seventh lap, which put him out, Watson then had a lengthy pitstop reporting vibrations (which eventually turned out to be caused only by a flat spotted tyre) and then on lap 16 Andretti's rear suspension, battered in the first corner fracas, eventually came away. This all left Rolf Stommelen leading in his Hill, but with Carlos Pace's Brabham monstering him right behind. And then it happened. At the start of lap 26 Stommelen's rear wing came clean off as he approached the gentle left hander with the sharp hillcrest at the start of the lap. The car snapped sharply to the left into the barrier then rebounded airborne across the track and, aided by the sharp crest, scraped over the top of the barrier on the other side of the road before dropping over it where it killed five onlookers. Stommelen himself survived but with both legs, a wrist and two ribs broken. Contrary to popular belief given what had unfolded in the previous two days, the barrier had stood up to the impact, and ironically it had been Hill mechanics who had ensured this section of barrier was in good structural order. Without this intervention one can only begin to imagine the carnage and loss of life among the spectators just beyond that would have ensued. The race, astonishingly, continued for another four laps before someone brought out a chequered flag to halt things. In Nigel Roebuck's words: 'After the accident the Guardia Civil was just lashing out at anyone and everyone. There was complete bedlam. It was just unforgettable, seeing Rolf still slumped in the wreckage of the car at the top of the hill, conscious and staring straight ahead, and clearly in huge pain from his broken legs. Under the monocoque there was a body and the place was strewn with wreckage. There was a total absence of control. It really was a scene from hell.' Autocourse noted that: 'People I trust, who ran up the scene and helped control the crowd and carry off injured, told me it was fully 10 minutes before any ambulance came'. The win was awarded to Jochen Mass, who just happened to be leading at the time of the stoppage; Pace had crashed in avoidance of Stommelen. And thus F1 at Montjuïc was finished, the event collapsing under the weight of the organisers' folly and intransigence, combined with the circuit's inherent dangers in the first place. But it says something of the venue's enchanting character that it is so widely and fondly remembered having been used but four times for F1, and despite it ending as an F1 stop amid such acrimony. I sometimes wonder, without what happened in 1975, how long Montjuïc could have continued as an F1 venue. Its existence, in its current form, was shaky even before the 1975 race with many concerned about its safety and demanding changes. And this was the point in history that Bernie Ecclestone and the Formula 1 Association (later FOCA) recognised that injuries and fatalities were bad business, and sought to eliminate quick corners with barriers close from F1 tracks as much as possible. So, the rapid return leg and the run to the first corner at the very least would doubtlessly have had to adapt to survive, most probably with chicanes. It's not clear the extent that this would have been possible. To the modern eye Montjuïc is one of those venues that it seems impossible that F1 cars were ever allowed to drive on it, and almost from another planet as the modern circuits. So with all of this in mind it could be said that Montjuïc would have had to be dropped from the calendar eventually, even if the 1975 Grand Prix weekend had passed without a hitch. But I still like to think that, as with Monaco, with some adaptations it could have survived with broadly the same character as a special case. 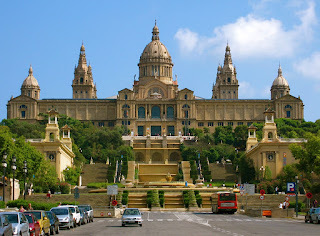 Montjuïc was certainly worthy of such status.